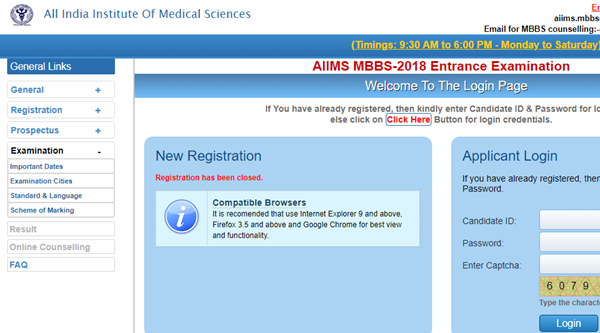 AIIMS MBBS Mock Round Seat Allotment Result 2018: All India Institute of Medical Sciences (AIIMS) has recently released the results on 18th June. Aspirants who had cleared the AIIMS MBBS examination have done with the exercising of options (mock allotment) from 23rd June 5 PM to 25th June at 5 PM. Candidates who had done with the mock allotment process can check the seat allotment of mock round from 27th June. Candidates can exercise/edit the options from 28th June 5 PM to 29th June at 5 PM. The organization will announce the 1st round seat allotment result on 2nd July. Students who are waiting for the AIIMS MBBS seat allotment can check more details from this article. All India Institute of Medical Sciences is a national level undergraduate medical entrance exam conducted to offer admission in MBBS programme. AIIMS entrance exam is conducted by All India Institute of Medical Sciences. AIIMS institution for a UG MBBS degree course. It conducts the exam to intake 672 admissions in Seven AIIMS institution including AIIMS, New Delhi. AIIMS provides both UG and PG courses in the Medical field. All India Institute of Medical Sciences is coming into existence in the year 1956. AIIMS located in New Delhi, Bhubaneswar, Bhopal, Jodhpur, Patna, Raipur, and Rishikesh. This Year The AIIMS has organized the MBBS entrance test on 26th and 27th May, respectively. The AIIMS Exam was held in various centers they are Ahmadabad, Hyderabad, Chennai, Bangaluru, Mumbai, Lucknow, Bhopal, Bhubaneswar, Chandigarh, Dehradun, Delhi, Guwahati, Jammu, Jodhpur, Kochi, Kolkata, Patna, Raipur. Lakhs of hopefuls from all these regions have competed for the AIIMS MBBS entrance test this year. More than 10 lakh hopefuls have appeared for the AIIMS MBBS entrance test this year. The AIIMS Delhi has released the results on 18th June. Now, the mock allotment and 1st round allotment results shortly. Candidates can check the AIIMS seat allotment result 2018 details from the following. All candidates who have been listed in the result notification No. 69/2018 dated 18.06.2018 will be eligible to participate in the 1st Round of the Online Counselling/Seat Allocation (In each category i.e. UR, OBC, SC and ST, the total number of candidates eligible for the 1st Round of Online Counselling/Seat Allocation is 4 times the number of seats available in each category). The seat allocation during the Mock Round represents the likely seat that a candidate will be allocated as per choices made by the candidate. After announcement of Seat Allocation for Mock Round, another opportunity will be provided to the eligible candidates to register/edit/reorder their choices before the allocation of seats in the 1st Round. Please note that the result of the Mock Round are only indicative and change may be expected after the 1st Round since candidates permitted to edit choices before the 1st Round. If the candidate fails to log-in after filling in their choice for the mock round, choices made in the mock round will be used for the 1st round. However their seat allotment shall be provisional subject to examination by the duly constituted Medical Board. The seat allocation will be done in order of merit and according to choices made by the candidates as described in point no 2. Candidates will be allocated the highest available choice considering their merit and their constitutional reserved category (if any). Allocation of remaining seats in the reserved category will be done after the allocation of seats in the unreserved category. 6. The seat allocation in the Mock Round and 1st Round will be done as per schedule specified in the Important Dates link. Candidates who got allotted seat in the seat allotment process can lock the option or even they can refuge it and try for the other option. Candidates those have allotted the seat will have to pay the prescribed fee in the form of DD (Demand Draft). Also, candidates will have to submit the documents before 6th July at 5 PM. Aspirants can check AIIMS MBBS Course Fee details from the following. Important: Failure to login and selecting an option within date and time specified in the Important Date link will lead to forfeiture of the allotted seat and render you ineligible for 2ndand 3rd round. Candidates who have come across the AIIMS MBBS examination and qualified the test can get admission in their desired colleges. AIIMS offers admission into MBBS course in various branches such as AIIMS Bhopal, AIIMS Patna, AIIMS Delhi, AIIMS Jodhpur, AIIMS Rishikesh, AIIMS Raipur, AIIMS Bhubaneshwar, AIIMS Guntur, and AIIMS Nagpur. Candidates can once go through the AIIMS MBBS Colleges list and the total number of available seat information from the following. The 2nd round will be initiated after completion of 1st round.